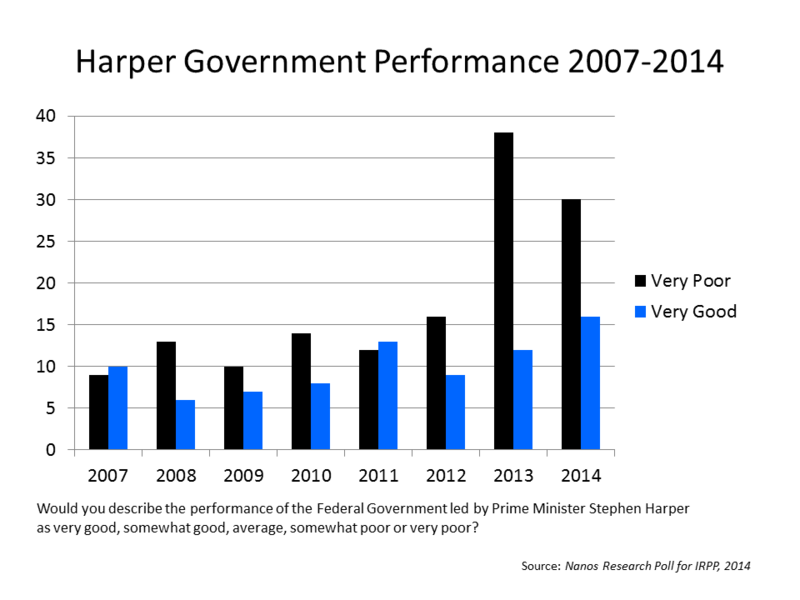 tcnorris: How well is the Harper government really doing? How well is the Harper government really doing? A version of this post has also now been published by iPolitics. Many political writers have concluded that there is growing support for the Harper government. However, there have only been three polls released in January, one of which from Ipsos reported a strong result for the Conservatives, leading to a claim the Conservatives were on the "cusp" of a majority (my own seat estimate from that poll, however, would actually see the Harperites winning 141 seats, enough for first place but nearly 30 short of a majority). The other two polls, from Ekos and Forum, would see the Liberals winning the most seats. Averaging Ipsos with the two other January polls would give the Conservatives 132, Liberals 126, the NDP 71, Green 1 and Bloc 8. A majority for anyone is a long ways off but the race between the Liberals and Conservatives for first place is appears to be close. Compared to four years ago, however, there is much stronger antagonism to the Harper government. Nanos Research has been conducting surveys annually since 2007 for the Institute for Research on Public Policy on the mood of Canada. Its most recent write-up reports finding "signs of life" for the Harper government. This document is useful because we can compare current circumstances to previous years, particularly 2010 and 2011, when the polls were conducted five or six months before and after the May 2, 2011 general election. One question asked respondents to grade the performance of the Harper government (See survey details here on page 3). I have isolated those who thought the government's performance either "very good" or "very poor" and put the numbers into the chart to the right. My view is that the "somewhat" category should be seen as expressing ambivalence; they are therefore excluded from the chart (along with the "average" category). While the Harper government continues to a have small group of enthusiastic supporters, beginning in 2012 and continuing in 2013 when the Senate scandal dominated headlines, a large percentage of Canadians came to judge the government's performance as "very poor". The number dipped a bit in 2014 but given the limited interest of most Canadians in politics the 30% who say the performance of the Harper government is "very poor" is a remarkably high number. The last couple of months have produced events that should have strongly favoured the Harper government, including announcements of a balanced budget (now in doubt), imminent tax cuts, and a higher profile for national security issues following the events on Parliament Hill and the House of Commons vote the same month supporting the international campaign against ISIS. Even the drop in oil prices should have helped given that the Conservatives have the reputation of managing the 2008-2009 economic crisis well. The government has spent millions on TV ads to remind us all of their fiscal virtues, and terrify us about the prospect of marijuana being legalized. All the while the Conservative Party has offered up continuing reminders via radio, television and internet of why in their view Justin Trudeau should not be considered a suitable prime minister. Given all this shouldn't we be asking ourselves why the Conservatives aren't stronger? While the polls have moved somewhat in Harper's favour in recent weeks, they are nowhere nearly good enough for the Conservatives to aspire to another majority. Ontario was the key to Harper's 2011 majority. There the Conservatives captured 44% of the vote and had an 18 point lead over the NDP and the Liberals. Recently an Angus Reid poll gave the Conservatives 43% of Ontarians in a poll of eligible voters (there was a slightly smaller share of 40% among the firm's estimate of likely voters). If accurate does the poll mean a repeat of Conservative majority looms? Here is a comparison of the 2011 election results in Ontario to a 2015 seat projection based on the Reid poll. In a first-past-the-post electoral system an 18 point lead gave the Conservatives 73 Ontario seats in 2011 (83 if applied to the expanded House coming in 2015). The Tory performance was a mathematical sweet spot nearly impossible to repeat, as the projection based on the Reid poll illustrates. The 18 point advantage is gone; even with almost the same vote share the Reid survey tells us Conservatives would lose about 18 seats in Ontario alone. Some recent surveys have given the Conservatives a lead in Ontario, but nowhere nearly enough to repeat its 2011 performance there. Utilizing an average of national polls from October through December I projected with my forecast model, a Liberal plurality of 135 to 129 for the Conservatives, 71 NDP, 1 Green and 2 BQ in the next House of Commons, again a narrow margin that could tilt either way. Stephen Harper is no fool; better to keep the majority he has as long as possible. Even if the Conservatives fortunes have turned up (by no means certain) the current political context rules out a spring election. Liberal strength remains as far from a majority as the Conservatives. What the next election appears most likely to produce is a House of Commons we haven't seen since 1972, when Pierre Trudeau's Liberals emerged on election night with a one seat margin over Robert Stanfield's Progressive Conservatives. The Liberals were able to govern because they secured support from the NDP, giving them a working parliamentary majority. A Liberal plus NDP majority has not happened since then (apart from the Trudeau/Chrétien Liberal majority governments). However, with the near disappearance of the Bloc Québecois, polling over the past couple of years tells me via my seat projections that an election reflecting the polling would have produced the Liberal plus NDP majority of 1972 to 1974 in almost every case. What could matter in the next parliament is inter-party cooperation between the Liberals and the NDP, something we have not witnessed in over forty years. Our Westminster-style House of Commons is too regionally fragmented to easily produce governing majorities given the current party system. It is time for the NDP and Liberals to develop a viable model of party cooperation - one that is in the interest of both parties. The NDP in principle is committed to cooperative parliamentary behaviour, given that it would be an inevitable consequence of proportional representation, a key plank in their current platform. In running for leader of the Liberal party Justin Trudeau endorsed ranked voting, which, if implemented, would create an incentive for inter-party cooperation, although Liberal Party commitments with Mr. Trudeau as leader have so far been vague. Some argue that recent conflicts between the Liberal and NDP caucuses make cooperation impossible. It seems more likely that parliamentary math would trump personal and partisan sensitivities, as would pressure from the parties' grassroots to oust the Harper government.